As iconic as difficult to work with, sapphire is the embodiment of invisibility: a paradox of solidity and visual transparency. Scientists –who call it corundum– know it as the second hardest material on Earth after diamond, almost impossible to scratch. For watchmakers, creating a case from a block of sapphire is a true technical challenge. It requires long and complex machining, grinding and polishing processes and superior expertise. The case of the BR-X1 SKELETON TOURBILLON SAPPHIRE is made from five blocks of sapphire, which are carefully worked on before being assembled with the greatest precision. 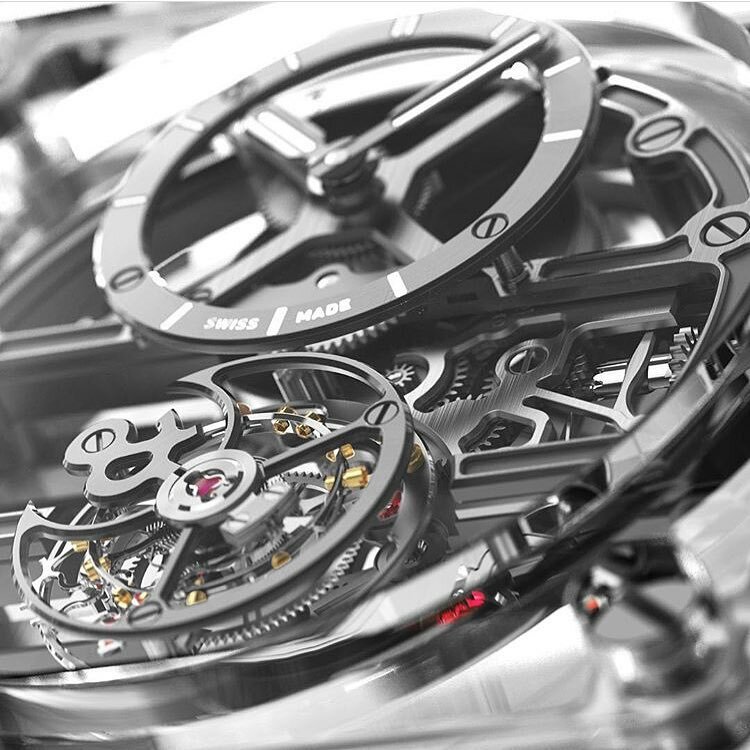 Thanks to the transparency of its sapphire case, the BR-X1 CHRONOGRAPH TOURBILLON SAPPHIRE created a magical spectacle in 2016 when its chronograph movement, paired with a flying tourbillon that appears to float weightlessly, was revealed. Last year, Bell & Ross’ design studio pushed the limits even further when it decided to develop an entirely skeletonized tourbillon. The transparency of the sapphire case was complemented by a “lace” effect of the open worked bridges, which laid bare the secrets of the watch’s mechanical heart through an off-centred dial especially designed to reveal it all. Now, Bell & Ross has set itself a new challenge: to continue experimenting with extreme transparency while adding colour. A number of monochrome movements have been individually produced, intended for the most discerning collectors. A single colour has been used for the main plate, bridges, dial, hands and tourbillon cage, thus creating a customized face for each unique piece. The first of these three exclusive pieces is black –the signature color of the Bell & Ross style since its creation and a reference to aircraft instruments. It offers the purest of contrasts with the transparent sapphire case and the translucent bracelet. The rubies in the tourbillon cage are the only touch of extravagance in this landscape of sublime purity. The second version offers an interpretation of the refinement and nobility of a precious metal. All the visible metal components of the movement are made from solid pink gold. Like a jewel enclosed in a glass case. The third BR-X1 SKELETON TOURBILLON SAPPHIRE honours the traditions of watchmaking with a movement inspired by the blued colour of the hands on vintage timepieces. This deep blue, paired with the transparency of the case and bracelet, adds a modern dimension to the watch. Bell & Ross is offering modern collectors the opportunity of purchasing two unique Haute Horlogerie pieces online. The black version of the BR-X1 SKELETON TOURBILLON SAPPHIRE will be available exclusively online from the Bell & Ross e-boutique. The blue version will be available from 21st March on MR PORTER, the award-winning online destination for men’s style, which has been a Bell & Ross partner for a year.